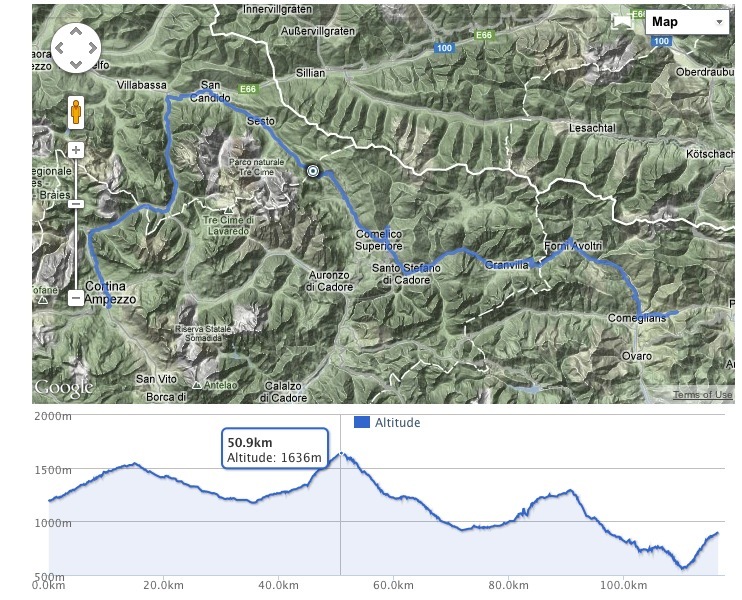 Moderately challenging — the main climb (from Auronzo to Misurina) has an altitude gain of a little under 900 metres. The loop to the Tre Cime di Laveredo is relat­ively steep, but you can do it unloaded. There are a couple of sections of road that could be busy depending on the time of day. There are traffic-free options to enable you to avoid them. Mixed. A signi­ficant proportion of this section is on cycleways with compacted aggregate surfaces. You could avoid them by taking to the road. The cycleways are signposted and easy to follow. On the roads you are reliant on general road signs. The major option is the loop to the Tre Cime di Laveredo. When I first rode this route I took to the road between Auronzo and Misurina. Returning in 2017 I was able to use the newly-built cycleway. (I rode the cycleway a couple of months before its official opening, and the construction work wasn't quite finished). 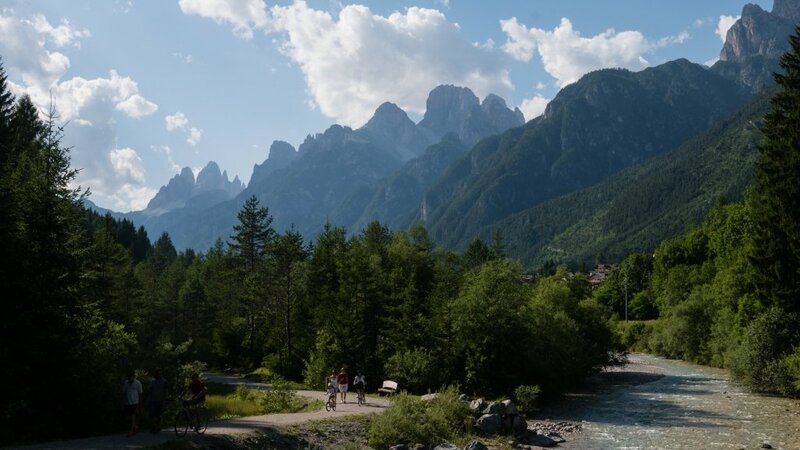 The local author­ities in the area plan to link the Auronzo-Misurina cycleway with the Ciclabile delle Dolomiti to form a 100-kilometre circular traffic-free cycleway in the heart of the Dolomites. The easiest place to pick up the cycleway is as the SR48 leaves Auronzo: turn left just before you get to the Bar Cooperativa di Reana, and then go down the hill to the lakeside. There's a parking area for mobile homes/​campervans to your right. For the first eight kilometres out from Auronzo the ciclope­donale follows the left bank of the Ansiei river (looking in the direction the river flows). It's relat­ively smooth, but gets more gravelly as you get further up on the less well-used sections. There are several points where you can swap from the road to the cycleway or vice versa. Once you cross over the river there are fewer oppor­tun­ities to change your mind — although there are a couple of places (at 13 and 15 kilometres from Auronzo) where you can cross back over the river and rejoin the road. 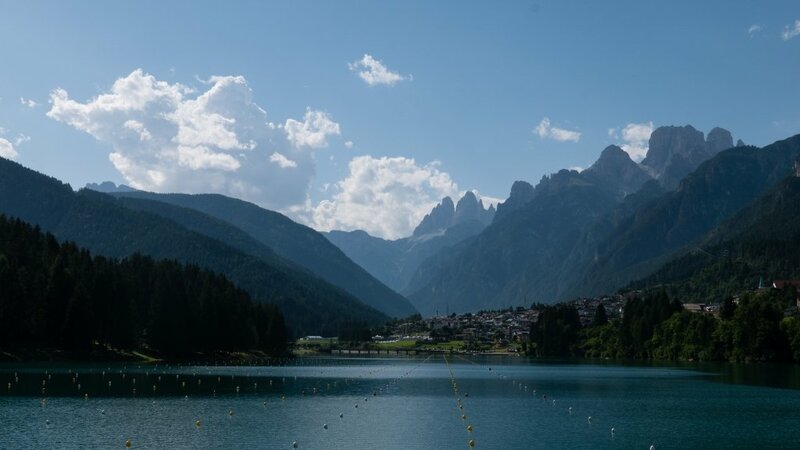 Auronzo is the major tourist centre for the area, so expect more traffic around in the mornings as people head for the lake at Misurina, and to the Tre Cime. The gradient on the initial section is very gentle: it takes over eight kilometres to gain 150 metres of altitude and reach the thousand-metre altitude point. The cycleway goes through the Somadida nature reserve. When you come to a junction with a fork leading to the visitor centre, look out for a little box which has on the outside Chi tiene pulito il bosco? (Who is responsible for keeping the woods clean?). Open it. (I won't spoil the surprise by telling you what's in it). If you missed the first box, there's another one at the next junction. Eventually, the forest gives way to a glorious area of meadow, overlooked by mountains, and the cycleway comes out onto a tarmac-surfaced lane, and you turn right. A couple of hundred metres or so further on the route turns left. The lane continues to a barrier and then from there to the main road. On the other side of the road is the Rifugio Cristallo with a bar and restaurant. The easiest option at this point is to take the road. The cycleway is shorter, but steeper, with an average gradient over the next 3.4 kilometres of 9 percent (and a couple of shortish ramps that were signed as 15 percent). The road and cycleway take you to another altopiano where cows graze in summer. The Lago di Misurina is known, at least according to the tourism marketing people, as 'La Perla delle Dolomiti'. The setting could hardly be more spectacular: in one direction there's the north face of the Sorapiss massiccio and in the other the Tre Cime. 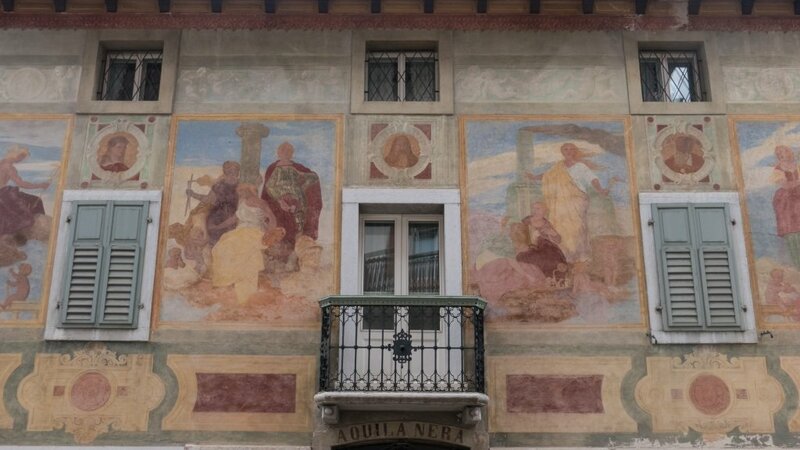 Unfortunately, it's a little spoilt by the fairly unattractive buildings in Misurina itself. The climb to the Tre Cime di Lavaredo is absolutely worth the effort, although it's easier if you do it unloaded. See this page for the map and altitude profile. When I originally rode this route, I took the SR48 Strada delle Dolomiti from the Lago di Misurina to Cortina d'Ampezzo via the Passo Tre Croce (1809m). It's very scenic, but I think it would be a shame to miss the Ciclabile delle Dolomiti cycleway. 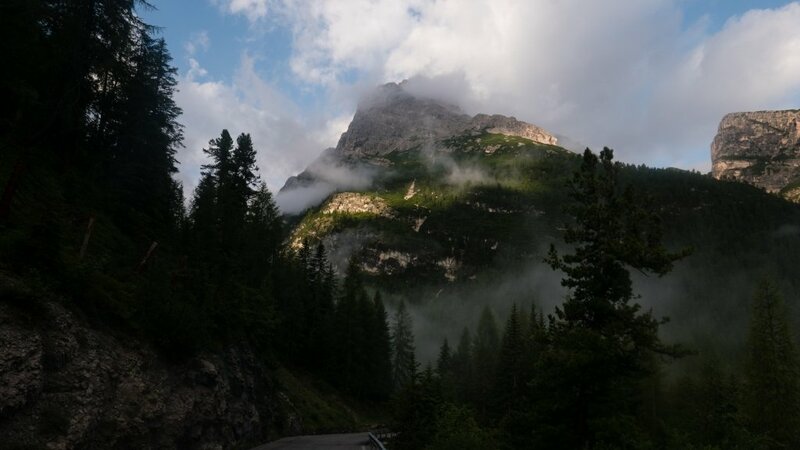 You might want to take the road option if you are planning to continue on to the Passo Falzarego that day, rather than stopping over in Cortina d'Ampezzo. The road takes you over another river and into the Südtirol heading for Schluderbach (Carbonin). At the bottom of the descent, the road goes over the Ciclabile delle Dolomiti. Turn right (or left) to join the cycleway. From Carbonin, a short climb brings you up to Passo Cimabanche (Im Gemärk/​Sorabances) — altitude 1530m — and back into the Veneto. The cycleway from here to Cortina, 16 kilometres further on, is almost entirely surfaced with compacted aggregate. There are parts that get a little rough and stony. The amount of traffic on the main road seems to vary a lot, depending on the time of day, so you may want to take a look before deciding on which option to take. There are plenty of oppor­tun­ities to change your mind before you get to the Pass Cimabanche. The cycleway and the road continue together to the old station at Ospedeletto. After that they diverge, the road descends into the valley of the Torrente Boite while the cycleway continues on the valley side, with the Monte Cristallo group on your left-hand side, descending more gradually down into Cortina d'Ampezzo. The cycleway brings you to a junction with the SR48 as it descends from the Passo Tre Croce. On the other side of the road is the old train station — now used as the coach/​bus station. At this point, you have to contend with Cortina's one-way system. My suggestion would be to turn right (onto the SR48) and then right again (the one-way system doesn't give you any other option). Follow the markings on the road for Belluno and Venezia, and then bear left. At the junction go left (signs for Belluno, Pocol and for the Falzarego and Giau passes). If you want to visit the centre of Cortina, then take the next left into the Piazza Pittori Fratelli Ghedina. The centre of Cortina is a zona traffico limitato, so it might be worth getting off your bike to be on the safe side. If you don't want to visit the centre of Cortina then continue on here (following the signs for Belluno and Venezia) and then go right (look for the signs and road markings for Pocol and Falzorego). This takes you to a round­about and then a bridge over the Boite. Auronzo, Misurina and Cortina are the major tourist centres for the area, but there are also a few places along the way between them. The Rifugio d'Auronzo is at the base of the Tre Cime di Laveredo. They offer beds in 6-bed dorms as well as double and triple rooms. 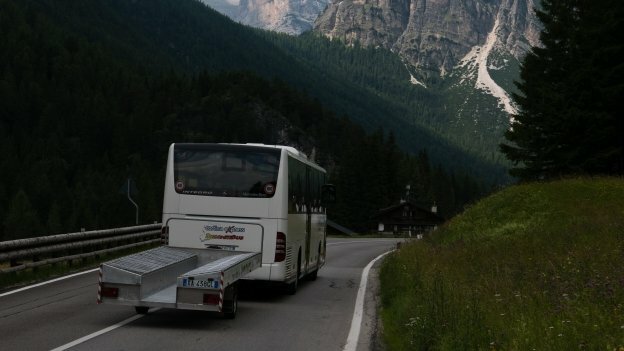 Misurina: Camping Alla Baita. Via Guide Alpine 4 (no website — +39 0435 39039 ). Is, so far as I know, the highest campsite in the Dolomites. It has a large area for tents., and is popular with climbers, hikers and bikers. In comparison with other campsites in the area, the facil­ities are basic, but the location and vies make up for it. The campsite is run by the same family that runs the Alla Baita restaurant on the other side of the road. 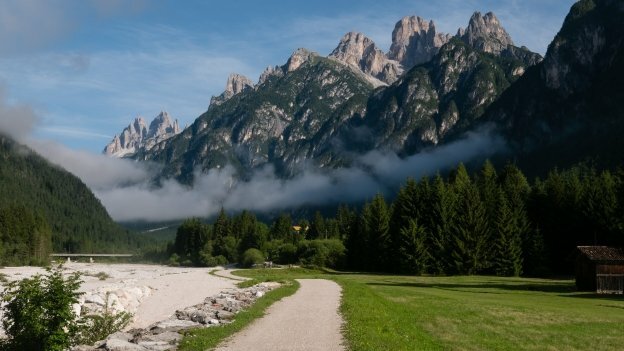 The Camping Olympia is four kilometres to the north of Cortina. There is a turning off the cycleway that means you can get to the site without having to go into Cortina and then come back out again. The others are to the south (next door to one another). One option for getting to them is to pick up the cycleway where it resumes after the bus station and stay on it to Zuel di Sopra where you turn right and go down the hill. The nearest train stations to this section of the route are at Toblach (Dobbiaco) and Calalzo di Cadore. Until recently you couldn't take bikes on the trains to and from the train station at Calalzo di Cadore, and you had to ride to the station at Ponte nelle Alpi. You can now take bikes on these services — but note that some trains are replaced by buses, so be sure to check the timetable. If you are travelling south to Venezia you will normally need to change at Ponte nelle Alpi, but note that on Saturdays and holidays there are direct trains to and from Venezia, and to/​from Padova and Vicenza. For both services, you must reserve the place for your bike, but you can buy tickets, and make reser­va­tions, up to five minutes before departure. 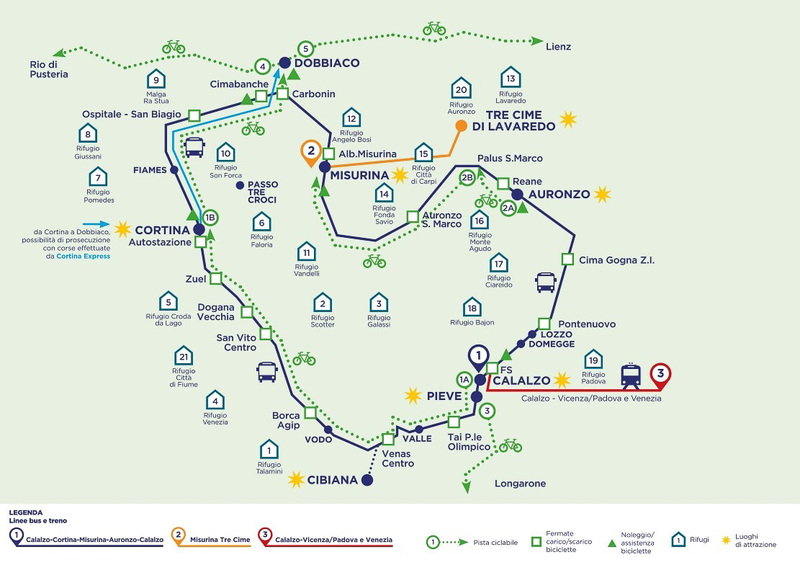 The Dolomitibus 'Trenobus' service operates on a circular route taking in Auronzo di Cadore, Misurina, the Passo Cimabanche, Cortina, and the station at Calalzo di Cadore. 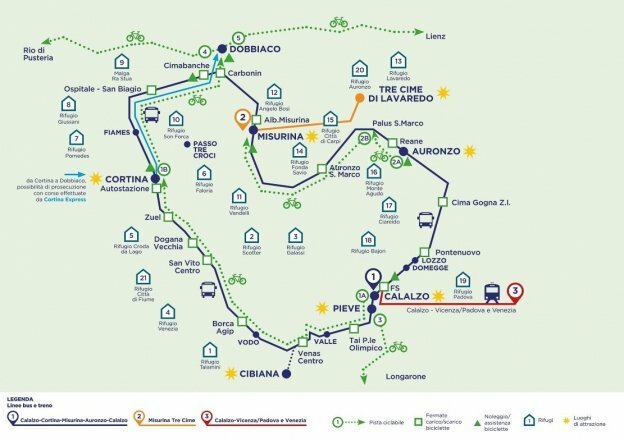 The 2017 timetable and brochure is available from the ciclabiledolomiti.com website (ciclabiledolomiti.com: trenobus-2017.pdf ). The Bike Express (bus with trailer for bikes) operates between Innichen, Toblach and Cortina operated by Cortina Express. When I last checked, the timetable on their website (Cortina Bike Express timetable ) was dated 2013. You can download the 2017 timetable from this site: Bike Express 2017 timetable . Note also that you have to book in advance, and you can only load bikes at certain stops (eg at Toblach train station and not at the bus station). 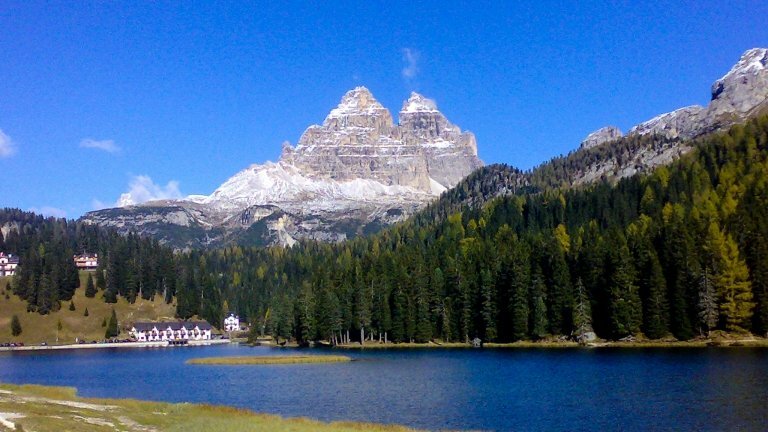 infodolomiti.it (it/​de/​en). Tourist inform­ation for the Provincia di Belluno. Includes an accom­mod­ation listing.